Ford has unveiled the all-new 2018 Ford Focus. The family hatch will be £2210 cheaper than the outgoing model and be cheaper to run thanks to a new range of petrol and diesel engines. The new Focus will reach showrooms in the autumn. Priced from £17,930, the all-new Ford Focus hatch undercuts the outgoing model on price and spec, with entry-level Style models now getting automatic headlights, alloy wheels, autonomous emergency braking, electronic parking brake and a spare wheel as standard. The engine range includes the familiar three-cylinder 1.0-litre EcoBoost petrol, but is bolstered with the addition of a new four-cylinder 1.5 Ecoboost unit that will use cylinder deactivation tech to save fuel under light loads. 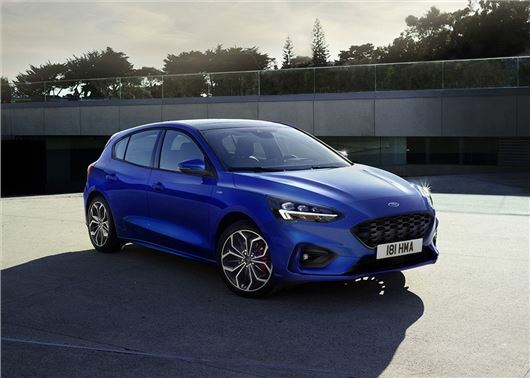 Outputs will range from 85PS to 182PS, with 1.0-litre units using a six-speed manual gearbox and 1.5 engines getting the option of Ford’s new eight-speed auto. Despite the backlash against diesel, the 2018 Focus gets two oil burners in the form of 1.5 and 2.0 EcoBlue diesels. Outputs range from 95PS - 150PS, but there are few details about economy. Ford tells us that the 1.5 EcoBlue will return 80.7mpg, while the 1.0 EcoBoost will return as much as 60.1mpg according to the advertised figures. All engines have been assessed under the new Worldwide Harmonised Light Vehicles Test Procedure (WLTP), but there are no plans for electric or hybrid powertrains at this time. The Focus line-up includes five-door hatch and estate bodystyles. There are also plans for an Active crossover Focus, with raised suspension and plastic wheelarch cladding. All use independent rear suspension. Active damping will also be available to improve ride comfort over Britain’s rutted roads. Passengers should get more space too, thanks to a longer wheelbase and a completely flat floor. As you might expect, the new car is laden with tech; adaptive cruise control now features a stop and go function for navigating through traffic. It will also be capable of reading speed signs so it can automatically adjust its speed to comply. Drivers can specify the Focus with a head-up display as an option, so route directions and the vehicle's speed are beamed to the windscreen. Ford’s Pre-Collision Assist system now detects pedestrians and cyclists and can automatically apply the brakes if it detects a potential collision. Evasive Steering Assist will also help the driver steer around stopped or slower vehicles to help avoid accidents. At launch there will be five trim levels to choose from - Style, Zetec, ST-Line, Titanium and Vignale. Prices for the hatch will start from £17,930 while the estate in Style trim will be priced from £19,050. Range-topping Vignale models will start from £25,350 for the hatch and £26,550 for the estate. ST and RS models are expected to be added to the range in 2019. This moves the Focus into Audi A3 price and spec territory. It will be interesting to compare reliability and build quality between the two models, so I shall be studying the reviews with that in mind. I was always a Ford fan when my budget was lower, but since moving to Audi I’d hesitate to go back to Ford - probably a bit of badge snobbery going on, but this brings Ford back on to the radar. ST and RS models will be added next year. This practice of delaying the introduction of "hot" models has always struck me as crazy commercial decisions. Anyone who was thinking of buying existing versions will simply not go ahead with their purchases ..... so delaying the introduction of specific models ,eans that Ford (in this case) will lose millons in lost sales. I have longed to buy a car with other fitments as standard, please tell Skoda about these changes. I have lately lost confidence since the raised road fund duty no spare wheel and changes to force extra payments for what we believed were becoming standard features on Skoda. Totally agree with comments from Wish, why, oh why do manufacturers say the same old claptrap about availability of the relevant “hot hatch/performance cars when announcing a new model? Absolute nonsense and as Wish mentioned, potential sales lost through uncertainty re new models. Wake up Ford and every other car manufacturer. When you introduce a new model, ensure ALL levels are available to purchase, it’s not rocket science is it!! One of the reasons that introductions of variants are staggered is that it makes the production ramp up of a new model easier as the number of variations that need to be built is lower. This makes it easier when everyone is still learning to build the car. Also when the demand is high at launch but production has not yet reached the maximum level it helps prevent long delivery delays building up. Another reason is that it is not always technically possible to have all drive trains or body styles ready for production at a model launch.